Seaside resort towns are among those with the highest rates of death from heroin and morphine, figures show.The rate in Blackpool, which topped the list, is twice as high as anywhere else in England and Wales, the Office for National Statistics (ONS) said.Its survey also shows that, of the 14 places with the highest such death rates, 10 are coastal communities.The ONS said many seaside towns struggled as foreign holidays increased in popularity.Public Health England (PHE) has suggested a link between areas of social deprivation and drug misuse. According to government figures, nine out of the 10 most deprived neighbourhoods in the UK are seaside communities, a list also topped by Blackpool. 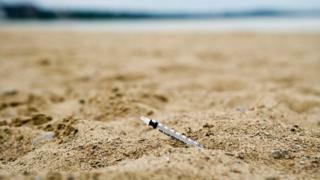 PHE said low rates of employment, poor quality housing and deprivation are associated with substance abuse.These social factors can reduce the success of drug treatment, it said.The British Hospitality Association has previously said it wants a "Seaside Tsar" to create "coastal powerhouses" and boost the appeal of run-down, dated and poverty-stricken resort towns.A general increase in death rates from heroin and morphine misuse occurred between 1993 (when data was first collected) and 1996, the ONS said. Since then they levelled out and remain at around 80% of all opiate deaths.According to the report, the rise has been linked to the so-called "Trainspotting generation" which became addicted to heroin in the 1980s and 90s. It said this generational addiction may also explain why the highest rate of death from drugs misuse in 2016 was among 40 to 49-year-olds.For the first time, that age group had more deaths than the group aged 30 to 39 years. » Is there a north-south divide in England's schools?